Summary: In this award winning essay, Native American teacher and NWP site director Michael Thompson, reflects on his own practice and shares findings from research interviews he conducted with instructors in tribal college and university classrooms to learn how they approach literature and writing. 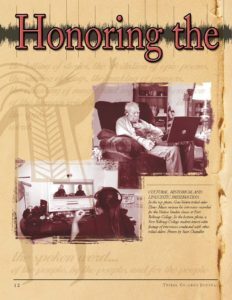 In particular, he wondered if assigned texts represented “the value that Native people have historically given to traditional stories, teachings, speeches, tribal journeys, and accomplishments.” Instructors reported that Native communities typically value the spoken word over the art of writing and described language practices such as collecting personal narratives of elders in documentary films and digitized recordings. Classroom teachers, study groups and professional development leaders interested in exploring resources and practices that support efforts to “reclaim and honor oral traditions” of native peoples may find this article of interest. But in numerous ways it has become evident to me that Native communities generally value “the word” itself above the art of writing and that there are, in fact, powerful and compelling reasons why this is so. In recent interviews for this article, I have found this opinion to be widely shared among tribal educators. Let me express these contrasting views as I have come to understand them. The Western view: A gifted individual, such as a Shakespeare, out of his own imagination uses the many complex techniques of rhetoric and composition to create a work of art, which we lesser mortals struggle to fully appreciate through a complicated process we call literary analysis. The basic difference here can be simply stated as the Tribe vs. the Individual. Reprinted with permission from Tribal College Journal of American Indian Higher Education, a quarterly magazine published at P.O. Box 720, Mancos CO 81328. For information call (888) 899-6693, e-mail info@tribalcollegejournal.org, or see the website at www.tribalcollegejournal.org.